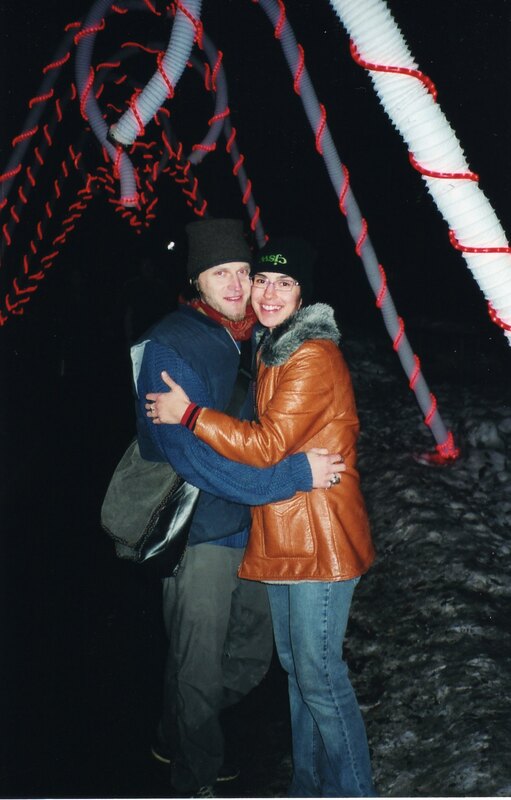 In November of 2003, I was decidedly single. ‘Mr. Wrong’, my on-again/off-again beau (if you could even call him that), had up and moved to Japan in August of that year, and we had only e-mailed each other a few times halfheartedly in those three months. I was waking up at quarter to five every morning (!!) and going to the gym for 2 hours as soon as it opened. I was also going to bed between 8 and 8:30 pm every night (out of necessity, to help facilitate my ungodly early morning routine), so yeah– I was definitely single. Fit… but single. 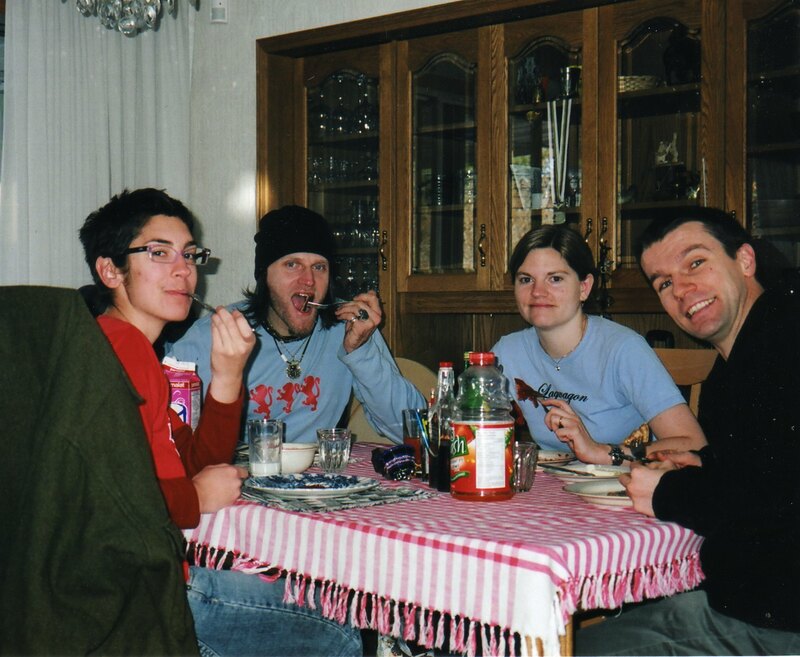 On December 6, 2003– a Saturday– I was spontaneously invited to a party by one of my friends from university, Colin. I sighed. Not only was I experiencing the heaviest period EVER that day (too much information? ), but my hermit tendencies were flaring up really badly and I didn’t feel like socializing with anybody or pretending to have a good time at some party (which of course, I wouldn’t be.) Besides, how would I be able to wake up for my morning workout if the party didn’t even start until after I would normally go to sleep? I didn’t tell Colin any of these things, but I mumbled that I couldn’t go. He pressed on and urged me to come. He was hosting a ‘listening party’ for one of his sets on CBC Radio. It would only be aired once and it was a big deal for him to have been selected as the emcee/DJ for this particular radio series. Plus, there would be 50 people there, so I could blend into the walls– cramping and kvetching all I wanted– without anybody noticing if I felt like it. All in all, he would be hurt if I didn’t at least make an appearance. Ah, the Guilt Trip… such an effective weapon to wield against somebody like me! (Ed. note: Please don’t go wielding this weapon against me just because I mentioned its effectiveness here.) Reluctantly, I agreed to attend the listening party. But I resented Colin every second before the party started for pressuring me into going. I was a full blown social recluse at that particular point in time, and I hated him for making me be interactive and festive. On Saturday night, Colin picked me up at 7 o’clock to take me to his listening party. I felt bloated and cranky. And resentful. Marty’s house happened to be only 5 minutes away from my own house by foot, so we arrived there in no time by car. (We drove why..?) Marty, freshly back from Victoria (and I do mean freshly back), ushered us inside and let us know we were the first people to arrive. He was a very welcoming and gracious host, despite having gone 16 hours out of his way to be there. Excited, Colin unloaded hundreds of dollars worth of food out of the car and onto the kitchen table in preparation for the big night! Half an hour passed, and we were still the only people at the party. An hour passed and we were still the only people at the party. By then, it was painfully evident that nobody else was coming, and that we had a mountain of food to chisel through by ourselves. I felt bad for Colin, stood up by most of his so-called friends in his hour of glory, but even worse for Marty, who had come all this way to hang out with two solitary people and listen to the radio. We passed the time before the actual radio show by flipping through some of Marty’s photo albums. I noticed with a flicker of appreciation how great Marty’s legs were in the shots (Deep Thoughts by Dana L.), but at that point, I was still bloated and kind of cranky. I was mostly ready to listen to this radio show and then head home to bed. The show finally came on and ended an hour afterwards, at midnight. Incredibly, I was still awake. The show itself was a really amazing collection of songs by Calgarian musicians, and for the first time that evening, I didn’t feel so resentful or upset that I was dragged the whole 10 blocks away from home to come to the party. I actually enjoyed the radio show! Then Colin, being the zany and offbeat character he is, suggested that instead of retiring to our own humble abodes for the night, we all sleep over at Marty’s house. because ordinarily– being both a Catholic girl and a certified hermit– I would never have agreed to this ridiculous idea. (And oh yeah, did I mention I was having the heaviest period EVER??) I would never, ever— in my right mind and better judgment– have agreed to sleep at a strange man’s home under these circumstances. But like I alluded to earlier, I was simply a pawn that night and the universe made me do it. So there. Under the spell of the universe, I found myself agreeing to sleep over at Marty’s house and then changing into Marty’s pajama pants (!!!) so I wouldn’t have to sleep in jeans. I said a quick prayer to the universe that I wouldn’t bleed through Marty’s (light blue) pants overnight and silently wondered to myself what the hell I was doing. Seriously, the whole night was so out of character for both Marty and I… there is no way we were acting on our own accord. Even though there were three whole bedrooms in Marty’s house, somehow all three of us: me, Marty, and Colin– ended up piling into Marty’s bed for the evening. I was feeling wildly uncomfortable in between the two men (with my period, I might add. Again. ), and I was certainly beginning to wish that I had just walked home for the night when I had the chance. After some silly photos captured our night for posterity (Colin’s idea– I was freaking out), I closed my eyes and tried to drift off into an awkward, G-rated slumber. Marty was looking back at me– also nervous, awkward, and probably acting against his better judgment– but his stare was so deep and warm, it was all it took for me to fall in love with him. Funny, I had looked at him all night without really seeing him. At that moment, though, my eyes were truly opened and I finally recognized him as an offering to me from the universe. He was everything I had been searching for. It was like in the movies when all of the background noise gets muffled and the only thing that matters is what’s right in front of the main character… and Marty was all that mattered to me just then. (Colin, btw, decided to go home after all and left Marty and I to fall in deep sweet love together. His spider senses must have suddenly alerted him to his impending Third Wheel Status Of Doom, so he bolted out of the bed and left in a real hurry.) Marty and I, finding ourselves alone à la that infamous Tiffany song, stayed up all night talking to each other (for real– not used as a euphemism here) and discovered with amazement and excitement what a perfect match we were together. I remember how happy my heart felt that night and how overjoyed I was to have met such a wonderful person under such awkward and unlikely circumstances! I WAS IN LOVE!!! AGAINST ALL ODDS!!! I was brimming with jubilation and thankfulness! The night gradually gave way to morning, and Marty and I still hadn’t slept a wink. Who the hell are you and why the hell are you wearing Marty’s pants??! We all ate wholesome buckwheat pancakes with fresh raspberry sauce that morning. It was an awkward encounter, for sure. (Them: “Gee, I don’t recall Marty ever mentioning you before..”, Me: “Um, we actually just met last night.” [painful silence]). However, when I left Marty’s house afterward, I did so knowing that I had found my soulmate and that we were in love with each other. That was Sunday morning, and by Monday evening, Marty and I had moved in together. (Taking it slow, like the slow learner I am.) On Wednesday of that same week, we said the ‘L’ word out loud to each other (and meant it!) And a year and a half later, we were married. This was on the first Monday. 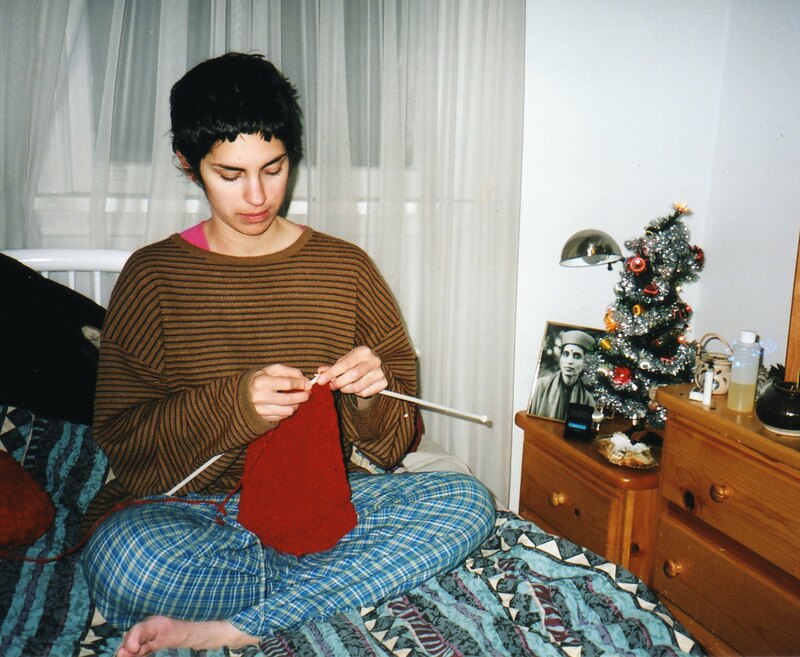 Yes, I am wearing Marty’s sweater AND pants and am busily knitting an acrylic scarf. I think I had bed head for a whole month after meeting Marty. Our first awesome ‘couples’ shot, a la junior high grad. Ah, young love!